Come help us celebrate the release of my latest book, Help Your Group Thrive: A Workbook and Planning Guide, Routledge Books, for leaders of work groups, book and service clubs. This book is also written for leaders of book groups, writer’s and critique groups, self-help groups, and community organizations. 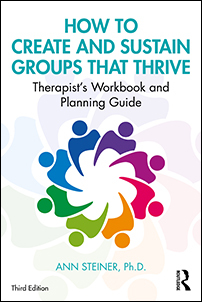 Like my popular book for therapists, this workbook and planning guide includes an overview of different kinds of groups, leadership tips, sample group agreements, online netiquette agreements, tips for dealing with "difficult group members," etc. Pre-Order your copy NOW to get your copy hot off the press, without shipping charges! 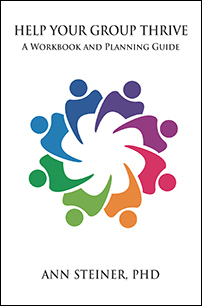 This easy-to-use manual guides leaders of discussion groups, peer support groups, organizations and workplace teams. It provides leadership tools, sample group agreements, online netiquette, and numerous modifiable forms.This workbook includes guidelines that can enrich and protect writer’s critique groups, book groups, work groups, psychotherapy groups, etc. The material has been applied successfully to self-help groups, and other paraprofessionally led groups. Whether you are considering starting a book group or wanting to find ways to recruit new members who will stay, this book has tips and suggestions that will help make your group safer and longer lived. Routledge will mail your copy to you without shipping charges when the book is released! (Plus Priority Mail Shipping and Handling of $5.15 and sales tax of 9.25% for California residents.) Allow 2-3 weeks for delivery. For orders outside of the U.S., please email us for shipping costs. Call for quotes on quantity discounts.